What Are Tinea Versicolor Symptoms and Signs? What Are Risk Factors for Tinea Versicolor? How Do Health-Care Professionals Diagnose Tinea Versicolor? What Types of Specialists Treat Tinea Versicolor? What Are Some Alternative Diagnoses? What Are Tinea Versicolor Treatments and Medications? Are There Home Remedies for Tinea Versicolor? What Are Complications of Tinea Versicolor? What Is the Prognosis for Tinea Versicolor? Is It Possible to Prevent Tinea Versicolor? Pityriasis versicolor is an alternative name for tinea versicolor (TV) and one preferred by some specialists because tinea technically refers to non-yeast, dermatophyte fungal infections, the type of fungus that affects the body (tinea corporis, commonly known as ringworm), feet (tinea pedis, also called athlete's foot), or groin (tinea cruris, referred to as jock itch). Since the cause of tinea versicolor is a yeast rather than a true dermatophyte fungus, the term pityriasis versicolor (spots of different colors) is technically more accurate. 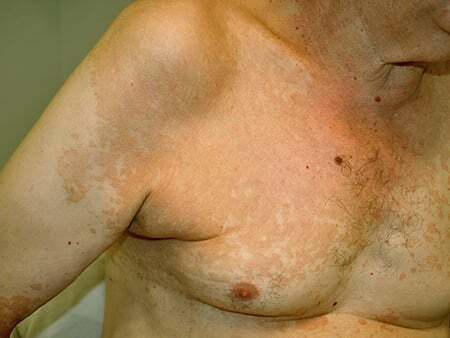 Though technically imprecise "tinea versicolor" is much more widely used. Picture of Malassezia furfur. SOURCE: Wikicommons. Tinea versicolor is a superficial infection resulting from a normal body yeast. It normally affects the back, shoulders, and upper chest, although it can involve the neck, upper arms, and rarely, the face. It produces a substance that leads to bleaching of the skin and pale patches that last for weeks, even after effective treatment. Malassezia furfur, a common human yeast carried by most people, can start to act more like tinea corporis (ringworm). While most people are never bothered by this yeast, it is also is felt to be responsible for dandruff (seborrhea), which explains why some of the treatments used for dandruff also help tinea versicolor. 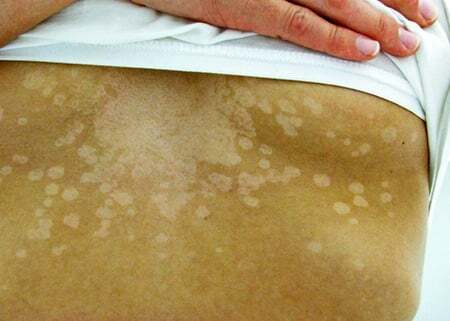 Discolored patches of skin are the hallmark of tinea versicolor. Versicolor means color variations, and characteristically it will appear dark or red on light skin, and light on dark skin. On the same patient, the appearance may vary over the course of the year depending upon whether the skin is winter pale or summer tanned. On the same patient, the appearance may vary with body location, being pink/brown on the mid back and pale on a tanned neck. The rash is usually confined to shoulders, mid-back, and chest, but occasionally it will extend further down the arms. Facial involvement is only occasionally seen, usually in African-Americans and other darker-skinned patients. Other skin findings such as severe itching, enlarging lumps, skin ulceration, hair loss, and swollen lymph nodes are not symptoms of tinea versicolor and should prompt a search for another diagnosis. Yes and no. The yeast that causes tinea versicolor is a normal human organism that lives on everyone's skin. It is believed to be acquired when a new mother first holds her baby in her arms. Even though everyone has the yeast, not everyone exhibits signs and symptoms of tinea versicolor. One gets tinea versicolor symptoms and signs because of one's own Malassezia furfur population rather than "catching" it from someone else. The only way to avoid recolonization for a "cure" after a treatment course would be to move after treatment into a sterile bubble with no human contact forever. Tinea versicolor is more common in males than females. It is most common in the teens and 20s than in younger and older individuals. These risk factors likely have to do with age and hormonally related variations in the natural skin oils. There are quantitative and qualitative changes in natural skin oils with puberty that gradually subside with age. Some have noticed that the condition worsens in hot and humid environments and seasons, something seen with most yeast and fungal infections. Worldwide it is quite common in hot, humid environments and is rare in dry northern nations. The diagnosis of tinea versicolor is often made clinically (by appearance), but the best way to make the diagnosis is with a potassium hydroxide (KOH) scraping that shows a characteristic "spaghetti and meatballs" of hyphae (which resemble long branches) and spores (spheres). Sometimes the yeast can be found after stripping the skin surface with clear adhesive tape and examining the tape under the microscope. Culture on regular fungal culture media requires the addition of fatty acids such as olive oil and is rarely necessary for diagnosis. 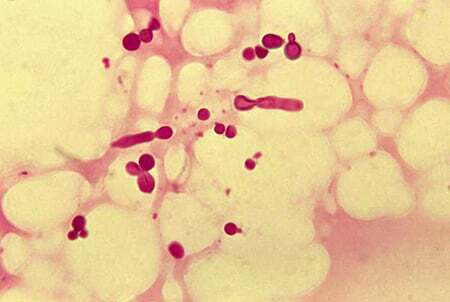 Biopsy may show the yeast hyphae and spores, but biopsies are generally only recommended for unusual cases and those not responding to therapy in the consideration of other diagnoses. Topical econazole (Spectazole), ciclopirox (Ciclodan), ketoconazole (Xolegel, Nizoral), clotrimazole (Lotrimin), and miconazole (Monistat) are all effective in treating tinea versicolor when applied until there is no further itching, scaling, or redness. Topical terbinafine (Lamisil) may be effective but may not work as well for yeast-related problems as it does for other fungal infections. Products that combine an antifungal with an exfoliating agent (Kerasal) or with an absorptive powder (Zeasorb) would be harder to use over a large area of the back and shoulders than a cream or spray. Smaller areas of tinea versicolor may be treated with topical medications, but extensive involvement and recurrences are best treated with oral medications. The treatment course depends upon the medication chosen, but short and pulse-dose methods are effective at controlling the yeast. The discoloration will take much longer to resolve, and there is no reason to extend the treatment until clearance. Effective oral agents include ketoconazole (Nizoral), itraconazole (Sporonox), and fluconazole (Diflucan). Griseofulvin (Gris-peg) is not effective for yeast and should not be used. Body washing with dandruff shampoos containing selenium sulfide (Selsun Blue), pyrithione zinc (Head & Shoulders, Soothe), and ketoconazole (Nizoral) may help the tinea versicolor clear faster and stay away longer. In the past, some have recommended application of shampoos for overnight use. These may be effective but are often very irritating to the skin. Zinc pyrithione-containing soaps (ZNP) may also be effective treatment. Although the topical and oral medications described above are likely safe in pregnancy, many will prefer to try one of these body-washing treatments first. Pregnant women should talk to their doctor about treatment options. A variety of home remedies are recommended for tinea versicolor. These are, for the most part, the ones that are recommended for other skin diseases such as eczema and acne. Many home remedies have some mild antibiotic and antifungal properties that might help, but in many cases, they may cause problems of their own. Tea tree oil, aloe vera, and garlic are all potential skin allergens and their application may cause an itchy, blistering reaction. Garlic is also a skin irritant as can be turmeric and apple cider vinegar when used excessively. Some home remedies such as coconut oil, oregano oil, and Indian lilac have the potential to encourage growth of the yeast, especially when they use an olive oil base. Yogurt has been recommended to be ingested and applied topically for the probiotic effect. While most home remedies are harmless, there are no studies to suggest that any of them, or diet manipulation, will be helpful in most patients. None of these have been studied in pregnancy and all herbal and "natural" treatments should be approached carefully in the pregnant patient. Talk to your doctor before starting any home remedy as some may interact with medications you are prescribed. The main complication of tinea versicolor is the skin discoloration that persists for weeks after treatment because the melanocytes (skin color-producing cells) require time to recover and properly pigment the skin. There are no permanent complications of tinea versicolor. As an entirely surface infection/colonization, there is no concern for deeper invasion in patients with intact immune systems. Malassezia may be a factor in pityrosporum folliculitis and, in stem-cell-transplant patients, may be a cause of lung problems. The prognosis for tinea versicolor is good overall. Most patients will eventually "outgrow" tinea versicolor, but it may take decades. Although recovery of pale areas is delayed, even after systemic treatment, eventually they will repigment. Once treated, maintenance body washes with over-the-counter (OTC) or prescription dandruff shampoos can prevent or decrease the rate of recurrence of tinea versicolor. Burkhart, C.G. "Tinea Versicolor." Medscape.com. Feb. 9, 2016. <http://emedicine.medscape.com/article/1091575-overview>. Gupta, A.K., D. Lane, and M. Paquet. "Systematic review of systemic treatments for tinea versicolor and evidence-based dosing regimen recommendations." J Cutan Med Surg 18.2 (2014): 79-90. Please describe treatment(s) you have received for tinea versicolor. What home remedies have you tried for tinea versicolor? Were any effective?